When I was a kid, I was all about choose your own adventure books. Did you ever read those? These sprawling sagas didn’t just have a linear path. Rather, they considered the disparate forks in the road that may come your way. If you were a fan of these stories, you know that if you wanted to you could effectively game the system and “beat” the book by reading the surrounding pages and reverse engineering the process. Some would do that. At times it felt necessary, especially after being killed by a cyclops or minotaur or whatever for what felt like the millionth time in a row. But for me, I thrived on the endless torment of finding the correct path. It was maddening at times. Yet, the experience was all the more fruitful for the trials and tribulations that preceded my eventual victory. Whether you were looking for a complex read or a simple one, the options were presented to you. It was life in fiction form, and for me, it was all about eliminating the wrong to find the right. As I’ve aged, though, I find myself more attracted to the simple things in life. Straightforward narratives are my thing, and really, when I read a book or comic or watch a movie or TV show, I’m less interested in all of the dressings that come with fan theories. Instead, I’m more into the joyous experience of a well told story. But like the choose your own adventure stories of my youth, some of the best fiction exists in the rare space in which the simple and complex cohabitate. Where someone like me can enjoy the characters and plot, while others can mine deep into the subtext or the unexplained to find another level of engagement. Paper Girls, the Image supergiant from the team of Brian K. Vaughan, Cliff Chiang, Matt Wilson and Jared K. Fletcher, is a perfect example of that. Its first volume just completed and introduced us to Erin, Mac, Tiffany and KJ, the four titular middle school aged heroines who unintentionally get mixed up in a conflict much larger than the war on deadbeat newspaper subscribers. Contained within its pages is wonderful art, engaging characters and a fascinating plot, or everything a reader like me could desire. But there’s also alien language decoding, mysterious trees of knowledge and time travel twists for the deep readers out there. In short, it’s a veritable smorgasbord for the discerning comic fan. Want to dig in like the clever code deciphering crew at The Dinglehopper? Go forth and prosper. Do you want to just kick back and go along for the ride like yours truly? You can do that too. Because of that, Paper Girls is the rare book that can be enjoyed by anyone. Its multi-faceted reading experience allows that, which makes a big difference. But let’s not bury the lede, here. If it wasn’t good, it wouldn’t work despite its ability to speak to readers of all types. It is good. Extraordinary, even, and for reasons both complex and simple as the reading experience itself. Let’s start at the beginning: the covers. Comic covers are an aspect I think about a lot. The amount of comics that come home with me strictly because what faced me at the shop is considerable. That’s because in its most basic form, a good comic cover should be something that grabs your attention. Something that says, “pick me!” amidst the sea of competing titles. The covers for Paper Girls certainly do that, as the bold, single color over inks look to the front and back of the comic is something we’re not seeing anywhere else. 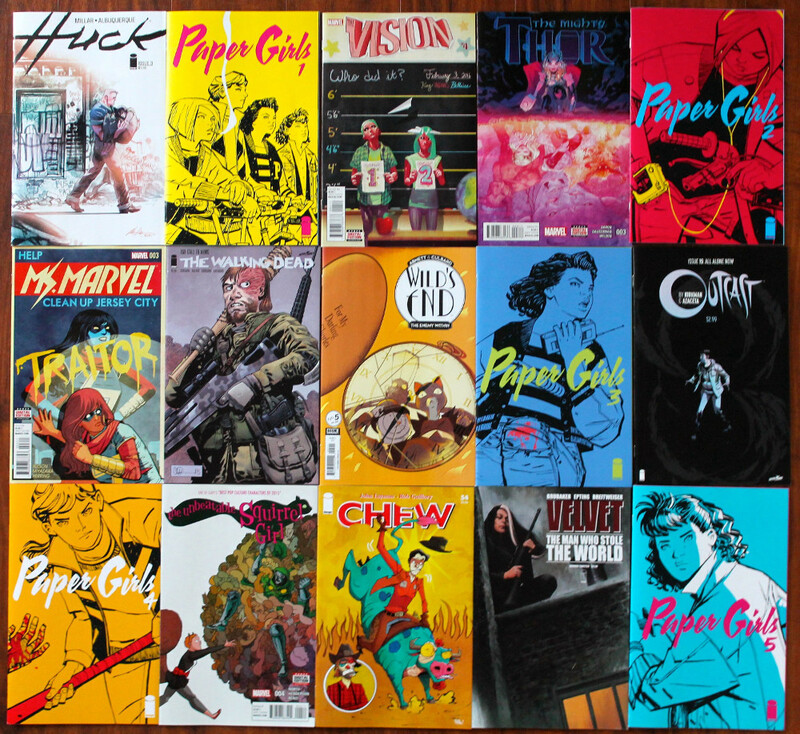 So when you’re walking around your comic shop and you see Paper Girls, it pops, as you can see below in a comparison with other recent covers. The word “simple” is one that can have negative connotations to it, but for comic covers, that can be a welcome term. Between titling and bar codes and logos and ratings and art and any number of other things, the average comic cover can become a cacophonous mess that says not much of anything. The covers above are actually good ones, not bad. They’re just the ones I had on hand. 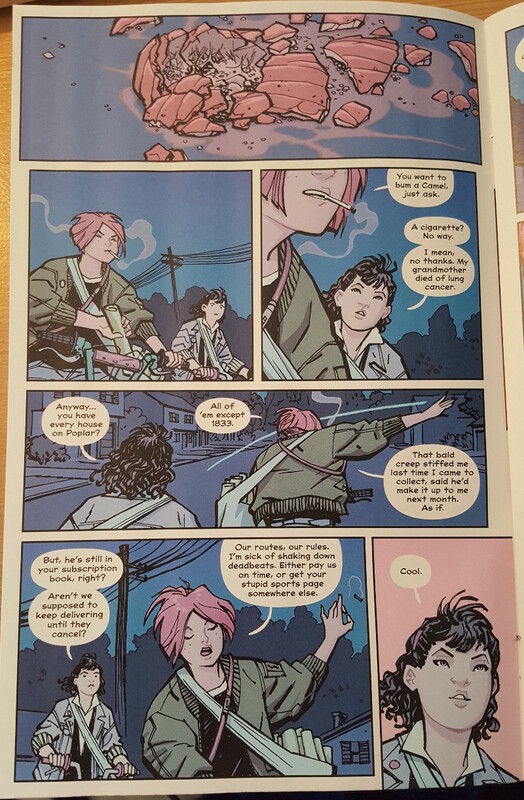 But even amongst its peers of a higher quality, Paper Girls and its clean, striking design stands out. But it goes beyond that. The covers exist as bold introductions both to the characters at the center of the book and the aesthetic of the era. We’re talking about the 80’s, so the covers fit the look with the deeply saturated, occasionally bordering on neon colors and a title typeface reminiscent to era specific films and magazines (as well as more recent fare like Drive or Kung Fury). Again, they may be simple, but they pack a lot of punch and carry implications for what the readers could expect within. Also, not to be forgotten is the hearty stock of paper the covers are made of. It gives the book a substantial feel, adding to the overall package. The look of the book is a significant plus throughout the first volume. Chiang and Wilson proved on Wonder Woman that they’re a phenomenal duo, and they’re doing career best work here. Chiang’s character work is paramount to us connecting with and understanding the leads of the book. Each has their own style, posture and feel visually. That makes them feel all the more real. 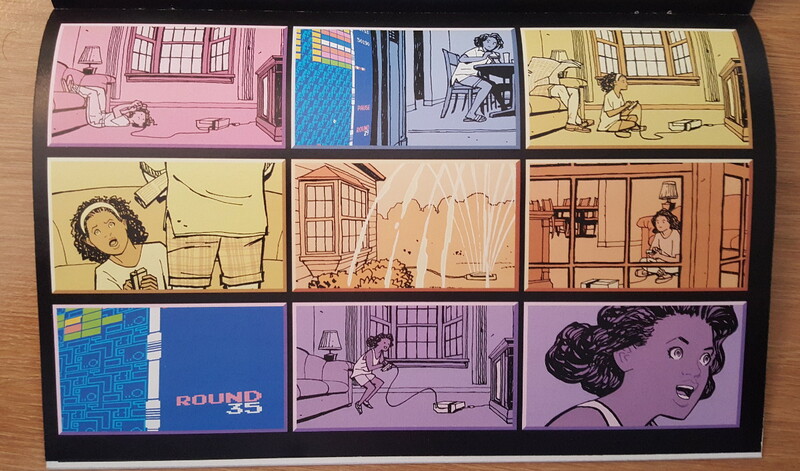 Wilson’s colors do a wonderful job of realizing the world, and he gives scenes bursts of color that help underline the mood of a moment and connect it with the reader. There are two great examples in the first issue where Erin fangirls out over Mac’s legendary, tough girl status. Chiang delivers the perfect admiring expression on Erin’s face while Wilson paints the background as a solid salmon color to match the warm, excited feelings she’s going through. It’s a quiet pair of panels, but something that stands out as a showcase for how well the two artists complement each other. The art team as a whole creates the right atmosphere and ambiance for the era within the book’s pages. Chiang fills the book with enough relics of the period – like a Freddy Krueger costume here or a Far Side calendar there – to remind us of where we are, but not to the point where we’re getting beaten over the head with it. Its detail to the world, not something that defines the book. Wilson’s colors match the period as well, although they aren’t as saturated as the covers. They’re era reminiscent, but not to the point they’re a caricature. His palette helps enrich the world and control the mood throughout. Fletcher’s letters are mixed case here, giving the conversations a warm, organic feel; but he makes his mark in surprising ways like in the 80’s video game esque “To Be Continued” font he employs at the end of each issue. The book is filled with clever nods to the period that enhance but never distract. One sequence that’s particularly married to the time underlines how well the team as a whole works together. While Vaughan is well known for his snappy dialogue and strong voice for character, he steps back when the story clearly doesn’t need it. One example was maybe the most memorable section in the first arc, showcasing what happens when Tiffany is snagged by an Editrix, an automated, many eyed sentry sent to capture the girls’ traveling partners. It’s a color coded four page flashback of what Tiffany sees when her entire life plays out before her eyes, as her years long dedication to the game Arkanoid is revealed. Within the art alone, volumes about her character are shared with the readers, and it’s an enlightening and frankly hilarious sequence that speaks to video game addiction. Wilson uses colors to indicate seasonality during the sequence, seemingly. From that, we’re able to subtly download aspects of who the character is from within. 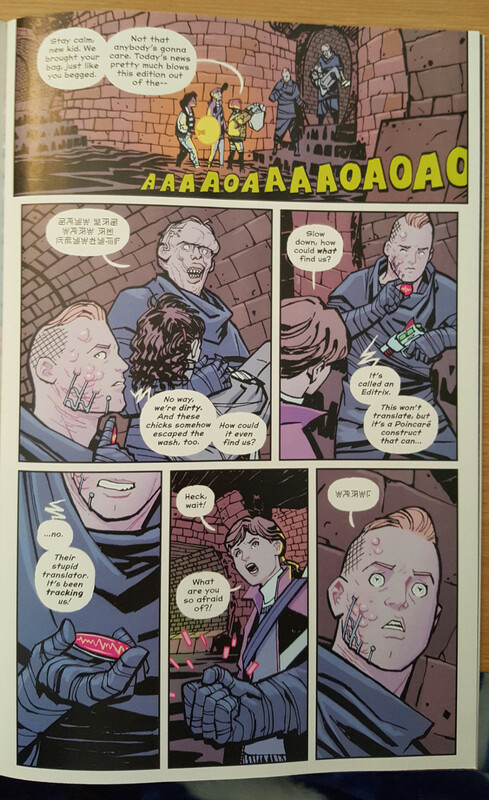 It’s brilliant, and one of my favorite sections of any recent comic. While it’s hard to derive emotionality from the creators of anything you read, it feels like Vaughan’s enjoying writing this book. All of the things that make us love the guy’s work are here – the exceptional characters and the lively dialogue, for two – but other elements show how enlivened he is by this project. Certain aspects bring to mind his time working on Lost, as the more sci-fi story beats are clever, thoughtful and mysterious in a way that isn’t insurmountable. A great example is the language of the ostensible good guys the four leads work with in the first volume. It’s something different than simple English, and like his work in Barrier, Vaughan doesn’t offer any translation for the reader. Instead, readers can choose to either solve the cipher themselves or move on with only a contextual understanding of what these characters are saying, like the girls themselves. It’s a clever challenge – even for the team maybe, as I loved seeing what Fletcher came up with for lettering – and it works either way. Some may be frustrated by this aspect, but for me, it adds to the fun of the read. The bad guys, on the other hand, talk in a bastardization of English that sounds like the lovechild of internet meme speak and the bizarre future society dialect David Mitchell created in Cloud Atlas. In a way, it reminds me of leet speak, or at least the shoddy approximation my friends and I used to chat in back when we played Counter-Strike. I just imagine Vaughan grinning as he’s writing dialogue for these two sets of characters, and that’s the true true. There are also big ideas in the mix, like time travel, the role of geolocation when you’re moving through time, and the mysterious “Ablution” the girls get involved with. Like the language, you can read into these elements more if you like to try and get a head start on what’s coming next. Or you can be like Iris DeMent and simply let the mystery be. It’s entirely up to you, but it gives the story and experience of reading the book valuable levels of complexity. Some of the big ideas lead to some fascinating philosophical insights as well, and ones that may play larger in the future. Naldo, one of the aforementioned “good guys” in this first arc, drops the line “yesterday’s trash is tomorrow’s treasure,”, a corruption of the well-known saying “one man’s trash is another man’s treasure.” It’s a small line, but something that may be more important than we realize right now. At the core of the book is a question of how age changes a person, and there are hints at a “generational conflict” that may be less explicit and more about foundational issues of the way youth and adults view the world. It will be fascinating to see how that plays out. So far, very little has been revealed about the story. The first arc was all about setting the stage, and some might not appreciate how few answers we’re given to date. But for this reader, not being spoon fed everything right off the bat is appreciated. It’s a slow build, and one I greatly enjoy. I have ideas as to what could be going on in the larger scheme of things, but nothing concrete. That only makes me curious and even more excited to see how things play out. My acceptance letter and card from the A.N.D.G. Like with the covers, though, the value of this comic goes beyond just what’s on the pages of the story. As you may have gathered, I’m fond of backmatter, and Paper Girls has quickly risen up the charts for my favorite letters columns and post read experiences in comics. Like in Saga, Paper Girls features fun, community building aspects like reader surveys and questions for the audience. There are posters and pin-ups of the characters as well. But this book has its own wrinkles. The American Newspaper Delivery Guild (or A.N.D.G.) is the name of the column, and it’s hosted by Petey Roy the Paper Boy. 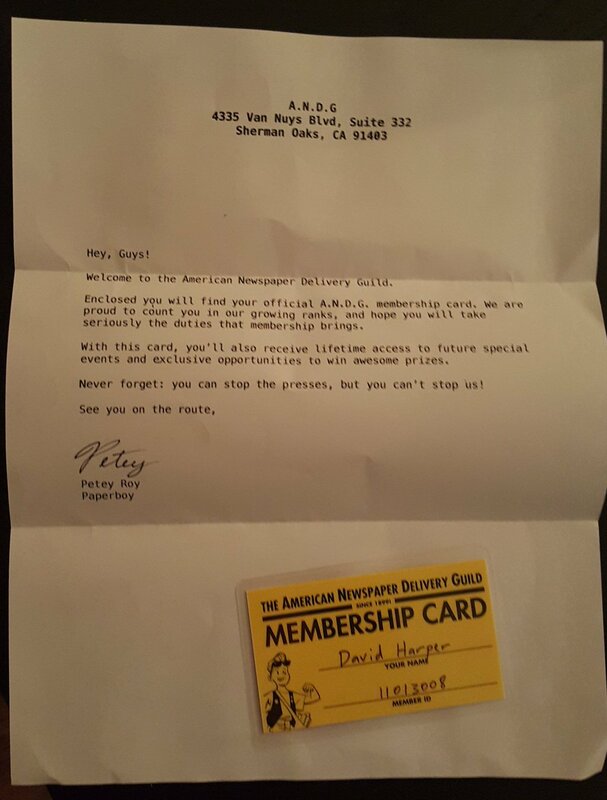 In the first few issues, Paper Girls had a membership drive for readers to not just send in a letter, but to become a literal card carrying member of the A.N.D.G.. True story: I joined, and I’d be lying if that didn’t make me that much more invested in the book. It’s a unique and title specific aspect that adds a ton of value for at least this reader. All of that and more helps make Paper Girls the book it is. You see, when I started conceptualizing this review, I reread the whole volume and wrote notes throughout. The incredible thing is in over 2,000 words, I haven’t even hit everything I wanted to. But that’s what happens when you have a comic that is firing on all cylinders like this one. Paper Girls is a comic that feels fully realized in a way few comics ever are. Like the best pieces of fiction, this story envelops us in a world that is familiar and enigmatic at the same time. And its loaded with depth, giving readers the ability to choose the version of the book they want to read – the breezy, fun adventure or the challenging mystery. Whichever you choose, you’re in for a treat. Paper Girls’ first volume is an exceptional start to the comic, and even early on, it’s a book that rivals the very best of the medium today. Art throughout from Cliff Chiang, Matt Wilson and Jared K. Fletcher. Looking for more on Paper Girls? Listen to Cliff Chiang and Matt Wilson discuss the book in their previous appearances on our Off Panel podcast. Haven’t read it yet? The first volume is coming in April. Pre-order it today.